A porter's lodge stood at the south-west entrance to the site. 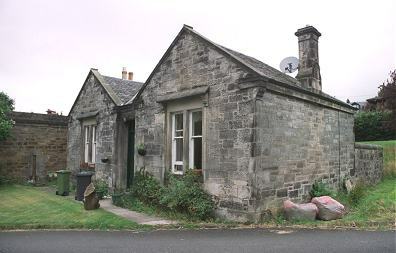 Dunfermline lodge from the south-east, 2001. 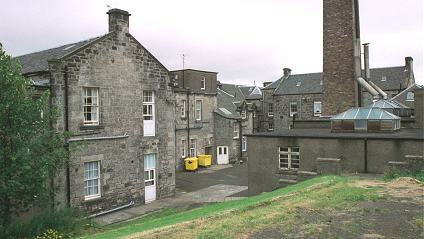 The original building followed the H-shaped layout typical of many Scottish poorhouses. The larger section at the front would have contained the Master's quarters, committee rooms and clerk's office. The two wings of the front block contained male and female accommodation. However, in 1905-7 the poorhouse buildings were extended eastwards. The original front block became what is now the west wing of the building and a new central portion and matching east wing were built. Dunfermline from the south (original portion at left), 2001. 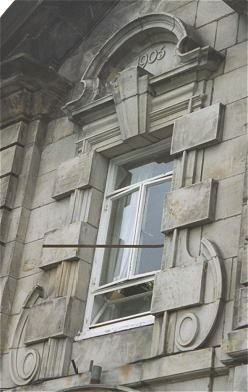 Dunfermline detail of 1905 central facade, 2001. The poorhouse dining-hall and chapel were located at the rear centre of the main block. Originally, the rear part of the poorhouse range would probably have been a row of single-storey work and utility rooms including a bakehouse on the men's side and laundry on the female side. Several new blocks were erected in this area as part of the 1905 enlargement scheme. Dunfermline from the north-east, 2001. A separate building at the north of the poorhouse may have been used as an isolation hospital. Dunfermline isolation block(?) from the south, 2001. In 1890, a Combination of parishes for the joint administration of poor relief was formed around Dunfermline. It initially comprised the parishes Beath, Carnock, Culross, Dalgety, Dunfermline, Inverkeithing, Saline and Torryburn. These were later joined by Auchterderran, then in around 1907 by Ballingry, and in 1909 by Aberdour. The Combination took over Dunfermline's existing parish poorhouse. In 1907, the Board of Supervision published extracts from the previous year's annual report by the poorhouse's governor, John Devlin. The work provided for inmates is various, and it may be said to embrace almost every trade,and every inmate, with the exception of the sick, is employed doing something. In the firewood factory employment can be found for any male inmate, some splitting wood, some bunching, others picking wood for the bunchers. They may be minus an arm or a leg, but you can always get something for them to do. I believe where you have plenty of employment it keeps the inmates contented. During the year the dining-hall has been enlarged, the female sick ward and dormitory above have been extended. An entirely new washing-house and laundry has been built and fitted up with all the latest washing and drying plant. A new kitchen and scullery and also a range of stores have been built and are now occupied. The buildings on the male side are making satisfactory progress and it is expected all the new buildings will be ready for occupation before next winter. The total cost of the extensions will amount to £11,000, giving additional accommodation for 102 inmates, and when one considers that for this sum, the accommodation provided in the now buildings and the improvements carried out in the old, and also the new kitchen, stores, washing-house and laundry and administrative block, the scheme has been very economically carried out. The poorhouse was later known as the Dunfermline Combination Home and Hospital. In 1946, it could accommodate 232 inmates, including 124 beds for the chronic sick. The buildings subsequently became the Northern Hospital but are now used as a care home for the elderly. No registers of inmates survive. Fife Council Archive Centre, Carleton House The Haig Business Park, Balgonie Road, Markinch, Glenrothes KY7 6AQ. Holdings comprise: Register of restraint and seclusion (1859-67) - it names 6 inmates: Robert Beveridge, George Westwood, John Campbell, James McNair, and George Philp; Dunfermline Cemetery registers of interments includes burials of some of the inmates from the Poorhouse. Some Management Committee minutes are held at Dunfermline Carnegie Library (Tel: 01383-602365).